I'm not sure why I've been fixated on this the last few days, how it entered my mind's eye, but I can't shake it until I get it out. 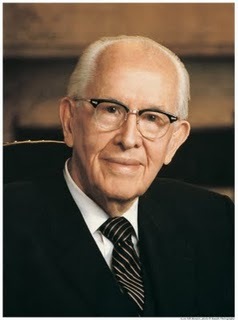 I believe that Ezra Taft Benson, former President of the Church of Jesus Christ of Latter-day Saint, and prophet of God, was an anarchist of the voluntaryist/libertarian sort, and that's a good thing. He spoke often about the need to defend and preserve the Constitution of the United States. Now, it is also my belief that constitutional government is a "pure manifestation of Socialism". How do I reconcile the belief that Ezra Taft Benson was both an anarchist and a Constitutionalist? That's easy, for the same reasons that I'm both an anarchist and a Constitutionalist. The important thing to keep in mind is that the people who have created their government can give to that government only such powers as they, themselves, have in the first place. Obviously, they cannot give that which they do not possess. So, the question boils down to this. What powers properly belong to each and every person in the absence of and prior to the establishment of any organized governmental form? A hypothetical question? Yes, indeed! But, it is a question which is vital to an understanding of the principles which underlie the proper function of government. You see, it's right there. Government cannot wield any power not first possessed by the people. Person A is not justified in using force to get Person B to pay for the services of health-care for Person A, nor is Person A justified in using force to get Person B to pay for the services of security for Person A. This is a basic principle, and the bedrock of voluntaryist anarchism. Because Person A is not justified in using force against Person B in this manner, Person A is not justified in giving this illegitimate power over Person B to a group of others he calls the "government". Not being forced to pay for someone else's needs is an inherent and inalienable right of every person. If the government violates these rights, it has violated it's "proper role". The state violates this proper role in two ways, 1) it uses force to extract payment from non-consenting persons, and 2) it uses forces to protect it's arbitrary territorial monopoly on the use of force. The state is unjustified in doing these. I have written on how the state violates the proper role of government here. Voluntaryist anarchism is "the absence of the state". If the state violates the proper role of government, and Ezra Taft Benson promotes that all government strictly adhere to it's proper role, then it follows that Ezra Taft Benson is anti-state, and thus a proponent of voluntaryist anarchism. What about his support for the Constitution? The only conclusions that I can make is that he either was unknowingly or unintentionally inconsistent with his views, or it was certain principles within the Constitution, that didn't violate the proper role of government, that he supported. Roderick Long wrote a very good piece looking at the idea of the separation of powers and how they are fulfilled under anarchism here. That's a good starting point in separating constitutional principles from the Constitution itself. Consider also Ron Paul. He defends the Constitution, but can also be considered a voluntaryist. The US Federal Government has all but completely destroyed the idea of Constitutional restraint. It's illegitimate powers are seemingly unlimited. Promoting the Constitution as a means of scaling down the Federal Government is a worthy endeavor, even for anarchists. Ezra Taft Benson spoke in favor of the Constitution at a time that the Federal Government was discovering all sorts of new powers. He was a necessary voice of warning for the American people. Based on his beliefs that government must adhere to it's proper role, and that the state does not, it follows then that Ezra Taft Benson was an anarchist and a voluntaryist libertarian (whether he knew it or not!). This is a really good article, Skyler. I can't tell you how many of my LDS brothers and sisters condemn my political philosophy by citing D&C 134 and saying, "There, see! Governments were instituted of God." I just want to say, "Have you *read* that section? Have you identified the attributes of the 'government' described in that section? Do you realize that none of our modern nation-states fits that bill?" Interesting post Skyler, although I think you need to define what you mean by anarchist before calling President Benson one. He certainly believed the role of government was limited to simply protecting life, liberty, and property. However, most anarchists don't believe in any form of taxation. In "The Proper Role of Government" President Benson said, "I maintain that every person who enjoys the protection of his life, liberty, and property should bear his fair share of the cost of government in providing that protection; that the elementary priing that protection; that the elementary principles of justice set forth in the Constitution demand that all taxes imposed be uniform and that each person's property or income be taxed at the same rate." So he supported a tax system, but only a principled one of everyone paying the same rate. Can an anarchist believe in taxation? Johnny, this is why I think he may have been logically inconsistent. Taxation is theft if it's levied upon non-consenters, which no one is justified themselves in committing, therefore they can't grant that power to government, thus it violates the "proper role" of government. If it's only levied upon consenters, then it's just a fee for service, voluntarily paid, and compatible with anarchism. Likewise, whatever service is monopolized, say security and the courts, to that degree you have a Socialist economic order. He abhored socialism. So again, he may have just not realized what his own argument meant, but I made qualifications for that (at the end there). I don't think he was logically inconsistent. Based on what he taught, I've come to understand that God has given us, as individuals, a right to impose a tax on others, as long as we are principled about it by taxing everyone at the same rate, and making it only a small percentage which is only to be used to protect life, liberty, and property. There is no inconsistency with this, because our rights originate from God in the first place. So if God tells us through a prophet that He has called that we can tax others in a principled way, then obviously we have a right to do so. Really? Fantastic! Please send me 5% of your income. I'll let everyone know that they need to send me 5% of their income, or face the gallows! w00t! Spot on. It's also the same full implementation of the logic of the morality of natural/unalienable rights that Rand failed to draw or admit as implicit from her ethics. If there is to be a government, then all taxes must be voluntary. In the United States, our foundational document--the Declaration of Independence--declares that all governments derive their powers from the consent of the governed. Notice too how in the church, nthings are done by unanimous consent--not majority rule--thus the saints grant consent to be governed by a prophet. How then does one grant consent to pay taxes? I did not vote to have my property, income, and purchases taxed. This theft or taxation was done without my consent. If taxes were voluntary, like tithing is, then I would be giving my consent and the government would no longer be in violation of theft of my personal property. Interesting ideas in this post. Indeed. I do most of my writing now at www.everything-voluntary.com. Be sure to check it out. Johnny quotes Pres. Benson without actually understanding what he said. He was speaking of, "every person who enjoys the protection of his life, liberty, and property". That doesn't includes any of the "citizens" of any modern nation state. Didn't Karl Marx say that once communism was fully implemented that the government would just fade away because the people would then see how wonderful it was just to share? Doesn't this make Marx an anarchist? Isn't one of the methods of the communist take over of a country, the inducement of anarchy? Considering the statements of Ezra Taft Benson about the communist conspiracy I find it hard to believe that he is an anarchist. This ETB article was one of the top 5 game changers for me, nice to be from a GA but importantly correct and simply put. Thanks for giving it airtime.